A perfect afternoon saw Graces return to posh south London to take on the youthful Sheen park. Asad and Yousef’s navigation led them to Barnes Bridge station which made them late – this was not a problem as after winning the toss Mahender put us in to bat. Niroshan and Scott opened for us and against steady bowling played very well in compiling a fine opening partnership of 84 in 18 overs. Niroshan hit 53 0f these with some nice cuts and drives – well done on a 50! Scott compiling a tidy 37 was probably disappointed not to get to his half century too. The watching supporters (Tom and James had returned from their Israeli adventures) and players must have thought we’d get well over 200 with such a great start – however this wasn’t to be! Neil in at 3 went 6 , 4 and then on his third ball was well caught on the long on boundary. Mendis following hit a boundary before top edging a catch. 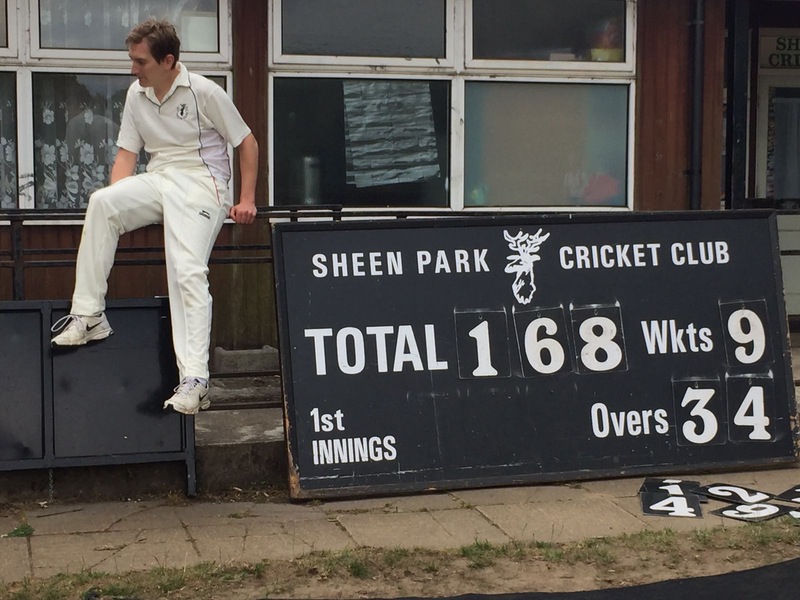 So 107 for 4 – Toby the off spinner was doing the damage pitching it up and tempting us! Mahender went on the attack with a quick fire 28 including some crunching fours supported by Dom. Mahender was well caught and when Matthew was bowled the game was finely balanced at 144 for 6. Jonners joined Dom to try to stabilise the innings but Dom was LBW bringing in Mamun. A suicidal call resulted in Jonners being run out and the tail failed to wag with our total only 168 all out – we had also only lasted 35 overs which was to prove costly! Sheen had bowled well and crucially held their catches – they are all young and athletic though! After a filling tea Graces took the field realising we’d need to get them all out with such a low total to defend – Asad and Mahender opening the bowling – unfortunately Harry the number 2 was in a hurry and started to compile fours worryingly quickly with support from Mr Smith. 50 came up in only the 10th over. We never really recovered from this and although we battled picking up 6 wickets the fast outfield and attacking batting from Sheen saw them home in the 33rd over. This left us ruing not batting the whole 40 overs as another 30 runs would have made it very interesting. Sheen are a very friendly and sociable team and we enjoyed the after match drinks at the picturesque local pub. Next week sees us visit Southall Dragons so we’ll need to bat better! Previous PostPrevious Eggheads here we come!